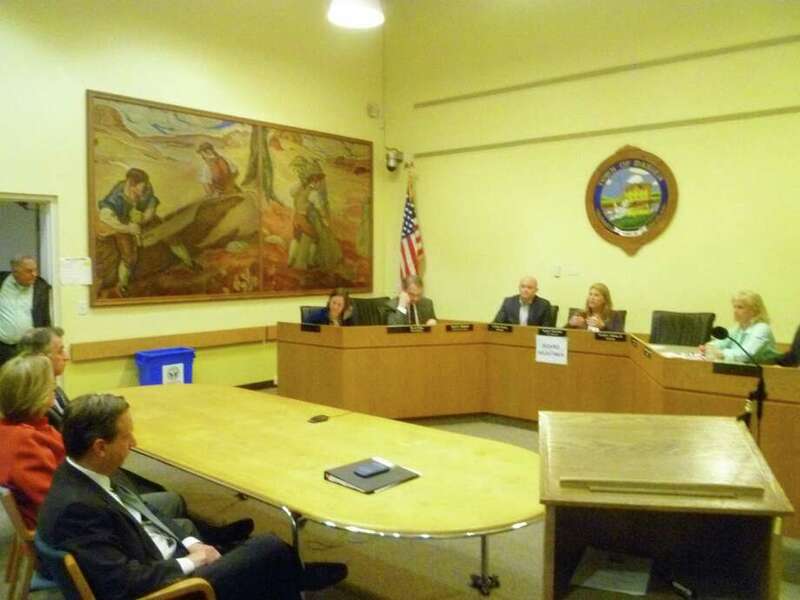 While recognizing that concerns about reforming property tax are valid, the Board of Selectmen and Darien residents urged lawmakers to kill off current legislative proposals from Gov. Dannel P. Malloy, including his plans to make the car tax more equitable and share commercial and industrial property taxes. On Monday, First Selectman Jayme Stevenson and others asked Sen. Majority Leader Bob Duff, D-Norwalk, Sen. Carlo Leone, D-Stamford, and Rep. Terrie Woods, R-Darien, at a Board of Selectmen meeting to scrap the slate of proposals put forward by Malloy, including one to create a new transit corridor development authority, because they are economically harmful. "I do understand you have the best intentions for the state of Connecticut on the whole, but I'll always try to remind you that you are elected to serve your constituents," Stevenson said. Stevenson drew applause when she said the state's assurances that towns will never receive less revenue in car tax than they currently do is irrelevant when towns consider the impact of a proposal that towns share 40 percent of the value of new commercial and industrial property development with surrounding towns. "How does sending millions more from Darien alone to the state coffers help us keep Darien's schools excellent?," Stevenson said. "I argue that when Hartford has its fiscal house in order, then and only then can we discuss how we can collaborate on voluntary solutions to fix our transportation system and reforming education systems in distressed communities." If approved, the proposals put forward by Malloy and state Senate President Martin Looney, D-New Haven, would allow the state to collect automobile taxes and distribute more revenue to less wealthy communities. Prospectively, there would be a flat rate of 29 mills for automobile taxes statewide, exempting the first $3,000 of value. Municipalities would also send 40 percent of the assessed value of new commercial and industrial properties to a regional council of governments to be used to "level the playing field" of economic development. A third component would also redistribute more payment in lieu of taxes -- a so-called PILOT funding-- to towns and cities with greater amounts of tax-exempt land; which are typically larger cities such as New Haven. "Those are three big ideas combined to try to figure out how to make it equitable," Leone told the Board of Selectmen. "It is not fully vetted yet and there are a lot of different opinions on the matter. ... There are some big ideas that are different than how Connecticut has done its business in the past." Connecticut eliminated county government in 1960, giving the state's 169 towns and cities great latitude in setting their local tax rates for property. Proponents of the measures point to more wealthy households paying many percentage points less of their income on property tax then lower-earning households in the state. "This is not language that is finished yet, but there is sense out there to try to regionally plan so towns and cities that are next to each other can work together so that there is a better way at looking at potential developments out there that doesn't pit one municipality against another municipality," Duff said. "So you don't have a city of Bridgeport with a sense of poverty in one spot and towns around it that don't have that same kind of challenge." Terming a set of prepared comments a "message to Hartford," Stevenson said the proposals are misguided and would disproportionately burden well-managed towns that kept low tax rates with supporting neighboring communities and support the state spending that should be reformed. In the fiscal year that ends July 1, the state is facing a budget deficit approaching $200 million, and a wider shortfall over the next two years of up to $3 billion. "The purpose and intent with which you and your fellow legislators are planning to neuter the principles of home rule are arrogant, overreaching and just plain wrong," Stevenson said. "Bullying your way to a redistribution of wealth and fiscal solvency for distressed Connecticut cities and towns will drive competition, innovation, and investments right out of the state." Duff and Leone told Stevenson and a packed hall of residents that the exact features of the tax and transportation proposals from Malloy are still going through the legislative process and could be changed. Leone said that there is significant concern about the inequality in car tax rates around the state that results in drivers in less wealthy municipalities like Bridgeport paying higher levies than in towns like Greenwich and New Canaan. The lawmakers pointed out that lawmakers had already scaled back another proposal by Malloy to establish a Transit Corridor Development Authority two weeks ago to remove a controversial provision allowing the 11-member board to seize properties near transit centers to develop. Stevenson and Selectman E. Reilly Tierney told the legislators they felt town and elected officials had done a good job implementing commercial and residential development around the Darien and Noroton Heights station. Stevenson offered the legislators a separate meeting on three commercial development proposals near the Noroton Heights train station. Stevenson said the bill's language still appears to give the 11-member transit corridor development authority too wide a scope of power to pursue development. "Do the three of you acknowledge that transit-oriented development in Darien is a horse of a different color than in Norwalk, or Stamford, Greenwich, or Fairfield?" Stevenson asked the legislators. "What I see in this bill is a legislative structure that allows for transit-oriented development in a one-size-fits-all for every community in the state with amenities around which development could be fostered." When asked by Tierney about what kind of development close to transit the state might seek to do in Darien, particularly near the state-owned Noroton Heights station, Duff said he wasn't sure what, if any, kind of development state officials had in mind for the town. "I don't know the genesis of the bill, but I will say I think there definitely is a sense in the legislature or throughout the communities to do more on transit-oriented development because we know people want to walk to the train station ... the usual stuff we talk about," Duff said. "The platitudes we all understand, but the specifics are something I can't answer for you." "This is the governor's proposal and we have to react to it," Leone said of the transit corridor authority proposal. "From a statewide perspective, we are trying to set it up in a way that we can (develop transportation) in a manner where we can do projects in order and get everything done." Tierney said he believed the town government had done a good job managing growth around the train stations to allow greater access. "When I think of Darien, I think of fairly advanced development around transportation whether it be the Post Road or Metro-North," Tierney said to Duff. "We'd love to have some help developing our train station, but what other things are out there we should be thinking about?" Jay Hardison, a member of Darien's Representative Town Meeting, said that the PILOT and car tax reforms put forward should never be approved under any circumstances. If the proposals become law, Hardison said, the town should strongly weigh whether to withdraw from the regional planning group. "I think the PILOT and car tax should not be issues we look at in the future. That's a local election representative issue in municipalities and if people choose to vote a certain way on people who want to spend money that's their problem not ours," Hardison said. "I was one of the six of the 77 in the RTM who voted against being part of the COG because we would lose control of our local process." Jim Cameron, a longtime commuter advocate and founder of the Commuter Action Group and RTM member, questioned why the governor and Office of Policy and Management would release a proposal for a Transit Corridor Development Authority that would impinge on local land-use power and have sweeping reach to set the agenda for economic development. The legislation, House Bill 6851, doesn't include explicit provisions to use revenue to improve transportation or access to transportation, Cameron said. "Why would the governor or OPM introduce legislation that would include the words `eminent domain?' " Cameron said. "I think it is too important for the entire future of this state to be rushed through in a matter of weeks or months. I agree with the first selectman, we should kill this bill." In addition, the guidelines proposed for the political appointment of the 11-member board of the authority would indicate the body would be aligned with the agenda of Malloy or future governors. Under the rules, four spots would be chosen by the governor, an additional three by the majority leaders of the legislature, and one each by the state transportation and housing departments. "Having the majority of the members appointed by the governor does not give one cause to think it would be impartial," Cameron said. "The mandate of this body is economic development, not station development and not improved access to transportation." Stevenson told the legislators she hoped they would return before the end of the legislative session with additional information about the evolution of the policies. "Certainly, my fundamental question to the three of you remains is how do these bills help the town of Darien?" Stevenson asid. "I don't think we have all the information right now."